Home /Recent Post/East & West Uttar Pradesh Chapter of NCHRO Formed. 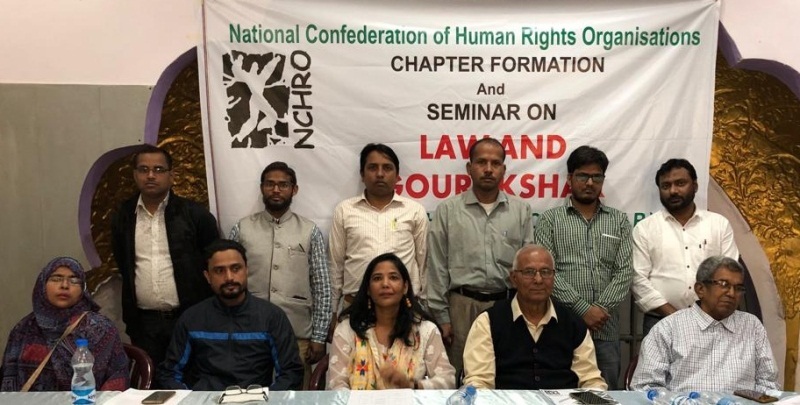 NCHRO Exco held in Bangalore on March 03, 2019 announced the timeline for the official formation of volunteer-run NCHRO chapter for the East & West Uttar Pradesh. The broad and sustained offensive on human rights continues in India’s most populous state. Complaints of human rights violations such as police excesses, encounter deaths, fake encounters, caste-based violence and attacks, Vigilante violence aimed at religious minorities, hate crimes, Mob rule etc. has risen in Uttar Pradesh, and the pattern and modus operandi of the attacks reveal a systematic programme. Most importantly local governments of not taking punitive actions against the perpetrators are visible. Trials take decades in cases against humanity, Conviction rates are abysmal, Witnesses turn hostile as a matter of routine with no adverse consequences, charging draconian laws like UAPA based on religion than the merit of case, Highly politicised police, all pointing to the culture of fear, hatred and impunity that has spread across Uttar Pradesh. Even family members of victims and human rights defenders working on the cases have been harassed, subjected to death threats and had false criminal cases brought against them in apparent attempts to intimidate them, added that it appeared that even police officials were not safe and could be killed by lawless elements (A full-fledged SHO of Uttar Pradesh police, Inspector Subodh Kumar Singh, posted in Bulandshahar district was shot dead, allegedly by a mob of cow vigilantes). On January 11, 2019 the United Nations Office of the High Commissioner for Human Rights had said four human rights experts have expressed concern about allegations that the Uttar Pradesh Police had committed at least 59 extrajudicial killings since the Bharatiya Janata Party government came to power in the state in March 2017. In July 2018, the Supreme Court had issued notice to the Uttar Pradesh government on a petition alleging that several fake encounters have taken place in the state in the recent past. The National Human Rights Commission of India opened an investigation on 9 May 2018 into 18 such deaths. The West Uttar Pradesh Chapter of the human rights organization NCHRO was formed in a meeting organized in the Apaar chamber in city. The Adhoc committee has been formed by consensus. The proceedings of the formation of the unit were completed under the supervision of NCHRO Exco Member, Adv. Ansar Indori and NCHRO Delhi Chapter President, Adv.Amit Shrivastav. Adv. Mohammed Afzal (Meerut) – Convenor. Zakir Ali Tyagi (Muzaffarnagar), Adv. Masroof Kamal (Bijnor) and Rita Bhuair – Joint Convenors. Mohan Kumar (Meerut), Adv. Haroon (Kerana), Adv. Ammar (Hapur), Journalist Tabish Fareed (Meerut), Sandeep Chandela (Meerut), Adv. Iqbal Alam (Meerut), Sandeep Nimesh (Agra), Sayyad Anas (Meerut), Adv. Sadiq (Shamli), Adv. Rashid (Ghaziabad), Adv. Ayesha (Bijnor), Adv. Jabbaruddin (Meerut), Hema Mathur (Mathura), Adv. Junaid Chaudhary (Bulandshahr), Adv. Shamshul Qamar (Bulandshahr) and Mehtab Ali Rana (Meerut). 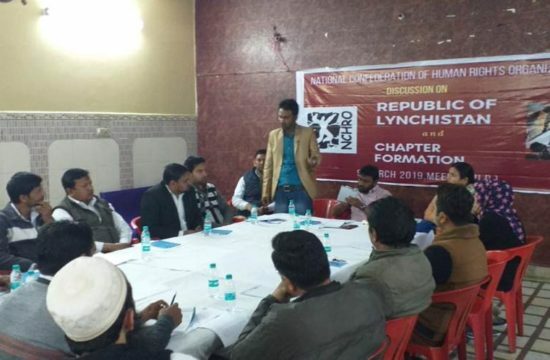 The East Uttar Pradesh chapter of the human rights organization NCHRO was formed in a meeting organized in the Uttar Pradesh Press club. The proceedings of the formation of the chapter were completed under the supervision of NCHRO Exco member Adv. Ansar Indori. Nahid Aqeel (Lucknow) – Convenor. Adv.Mohammed Yaqoob – Joint Convenor. Seema Azad(Allahabaad), Adv.Juned (lucknow), Adv.Malik(Bahraich), Kripa Shanker (Kushinagar), Adv. Faraz(Lucknow), S.R. Darapuri(Lucknow), Afiya Hameed(Allahabaad), Rohit Singh (Lakhimpur), Adv. Abhishek Singh(Lucknow), Adv. Abdul Wahab (Lucknow), Adv. Minakshi Kanaujia(Lucknow), Mrs.Mamta Singh (Lucknow), Adv. Imran (Lucknow), Adv. Nafees(Allahabaad), Dr. Sandhya Panday(Gorakhpur). 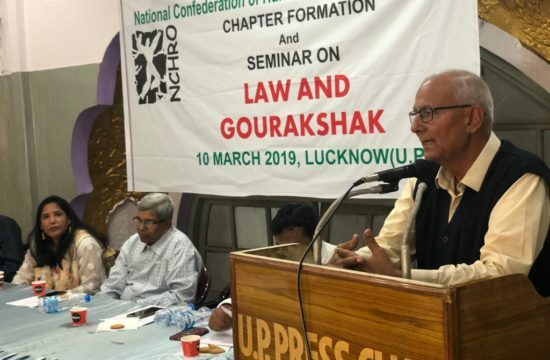 Adv.Ansar Indori congratulated the newly launched Uttar Pradesh Chapter of NCHRO and called for accountability for violations of human rights and violence against humanity in Uttar Pradesh. Accountability is critical for dealing with past violations as well as preventing future ones, he reminded. The NCHRO chapter is designed to address violence against vulnerable sections and to represent a wide-ranging and diverse membership from the largest state of the country.